eXo Chat is an instant messaging application that allows users to sync up and take action quickly. 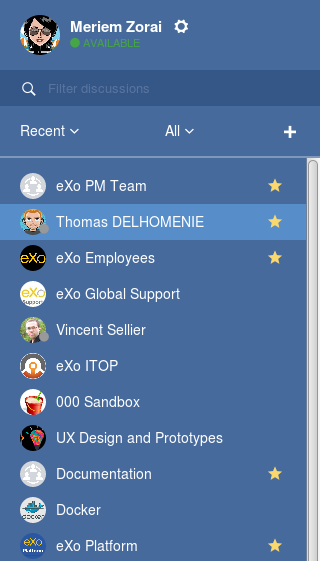 Tightly integrated since eXo Platform 4, eXo Chat empowers the real-time collaboration among teams and individuals. Discussions: Create quick conversation with your contacts, from group to specific person. Status: Don’t want to be interrupted, or not in the mood for a chat? Simply change your status from the Chat menu or directly in the chat window. Favorites: Add or remove your contacts to/from the favorites list with one click. Collaboration: Leverage collaboration with a set of actions (creating an event/task, sharing a link/file, asking a question or raising your hand), directly within eXo Chat. Notifications: Follow notifications sent to you in real time, read and answer messages immediately or later when you are free. Recording: Save your discussions from the beginning to the end that can be exported to a wiki page or sent to emails. By setting your status, you will let your contacts know if you are available to chat or not. Your selected status is shown next to your name. From the top navigation bar, click to open the Chat menu, then select one status. 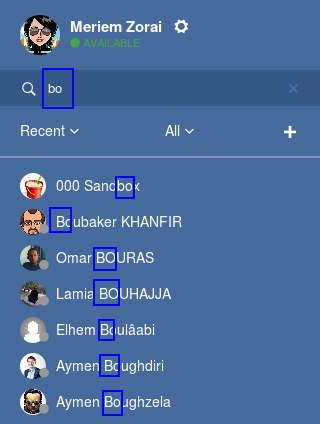 If you are in the Chat window, click your current status icon under your name, and select one from the drop-down menu. Available You are online and available to talk or get instant messages from another. When you use eXo Chat for the first time, your status is available by default. Do not disturb You are online but don’t want to be disturbed. Another can still send instant messages and call you. Away You are online, and another can talk to you, but you will not reply for now. Invisible You appear to be offline, but another can send messages to you. To minimize the mini chat window. To open the chat in another tab i.e it does the same as clicking on the button Open Chat. To close the mini chat window. Where the message is composed. Clicking Enter on the keyboard sends the message. The display name near the avatar of the user who sent the message. Clicking on chat button on the user profile. By creating a group chat, you can share work, knowledge and plans with your colleagues more efficiently. 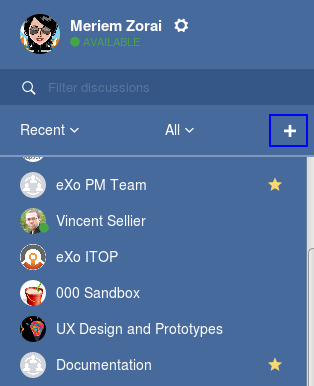 In eXo Chat, the “group chat” denotes discussion among space/team members. 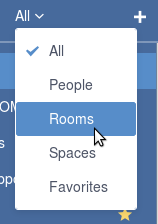 Your spaces (that you are owner or member) are auto-listed into the Spaces pane. From the top navigation bar, click –> Open Chat to open the chat window. 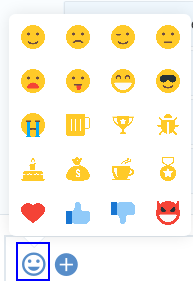 In the left pane, at the header section select to create a new chat room. 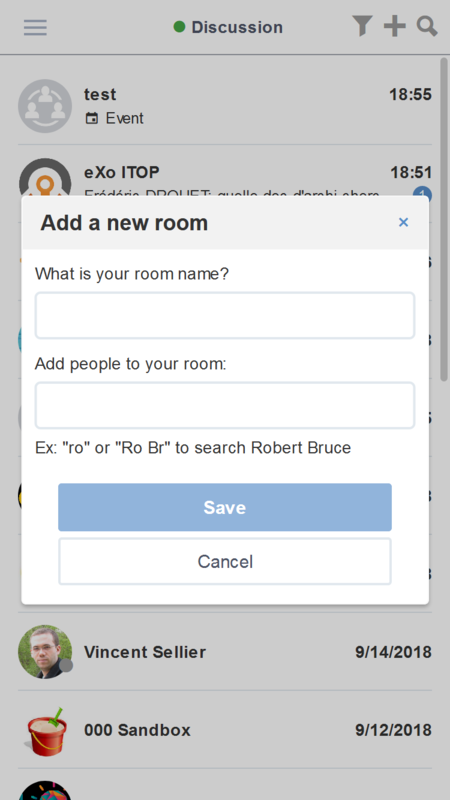 Enter the first letters from usernames you want to invite to the room. A suggestion list appears to facilitate the selection. This suggestion list proposes your connections at first level $ followed by other usernames sorted in alphabetical order. You can also remove a chosen username by clicking on near his name. 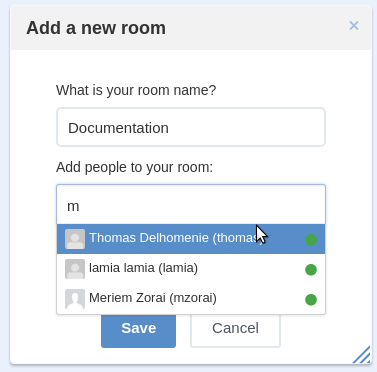 The room is created and a message is displayed indicating the members added. Select the room you want to edit. Click on the more actions button . Add more members (Same way as on creating a new chat room). Remove members by clicking the corresponding . The list that appears after clicking on contains the list of actions that you can make on the chat room. Only the chat room creator is able to edit the room. For chat rooms, a collapsible panel contains the list of the chat room members. 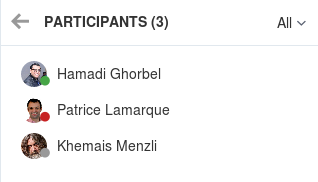 The side panel indicates the total number of members of the room, it displays a number next to “Participants”. In the side panel, people avatars are displayed combined with their presence badge. All users are displayed by default. To display only online users, you need to filter them . Find the contact you want to send message from your lists. The chat conversation is opened in the right pane. Type your message into the input box, then hit the Enter key. The selected emotions will be displayed on the chat zone. To check them, simply hover cursor over the Chat icon. Click one message to see the full content in the mini chat. Alternatively, if you are in the chat window, click the contact that you see the icon of unread messages. Hover cursor near the chat text to show “More actions” button . Note that Edit and Delete actions are only shown for your own chat texts. For ones of another, you only can Save notes and Quote. Click Save notes to save your discussion as a note. There are 2 options: Send meeting notes and Save as wiki that is similar to Recording. Click Edit message and make changes in the Edit message form. After clicking Save, your new content will be updated on the chat zone with a pen icon ( ) on the right. When you click on “Confirm” button, an information message is displayed in place of the deleted message with a pen icon on the right. Click Quote to append one message in the input box. On the chat zone, the quoted message will look like below. Click on the top header of the chat window to start recording. The is now changed into , and the record starts. The information message will be shown on the chat zone. If you select Save notes, the notes will be sent to your email. One information message is shown on the chat zone. If you select Save as wiki, one wiki page link is displayed. By clicking the wiki page link, you will be redirected to Wiki Home where the wiki page containing the notes is displayed as a child page. Open the chat room you want to leave. Click on the dropdown button to display the list of choices. Confirm the chat room leave by clicking on Yes button. If you click on No button, nothing happens and you still being a member in the chat room. The room creator does not have the Leave room button to prevent having orphan rooms. 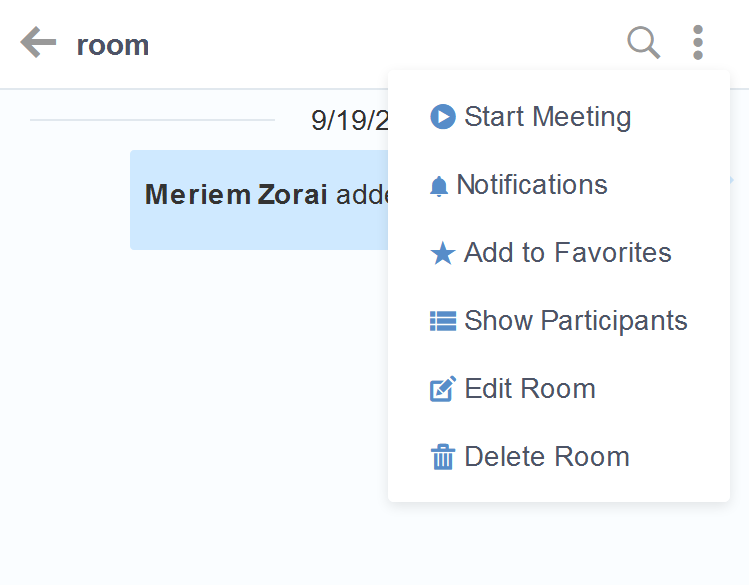 The Leave room button is not available on spaces chat rooms. To leave a space’s chat room, you should leave the space itself. Leaving a chat room deletes it from your chat rooms list and you will no longer have access to the discussion. When you leave a space, you automatically leave its chat room, but no message is displayed. If the chat room creator send you again an invitation to join the room, you will be able again to see old discussions. 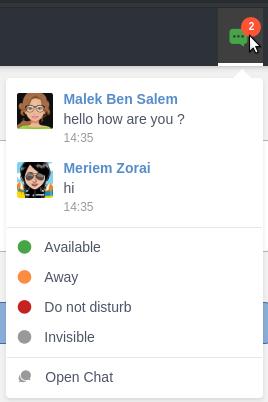 During a conversation, some collaborative actions are available on icon in the left of the message input box. 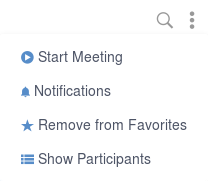 After clicking on collaboration actions button, it turns to which enables you to close the collaborative actions window. 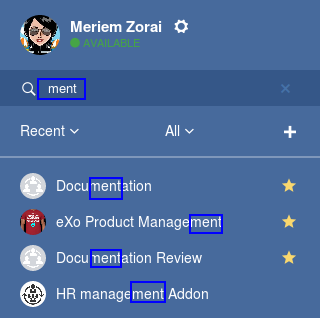 Select Add Event from the list of collaborative actions. Fill in the form fields, including the event title, dates and time, location. If you choose wrong dates, for example, when the end date To precedes the start date From, an error message is displayed indicating that the dates are erroneous. If you do not fill in all the needed fields, an error message appears indicating to fill in the whole form. Click Post button. The newly created event will be displayed on the discussion area with a calendar icon in the right corner. This action is available only when the Tasks add-on is available. Select Assign Task from the list of collaborative actions. Fill in the form fields including the task title, assignee, and due date. Click Post button. The newly created task will be displayed in the discussion area with a task icon in the corner. 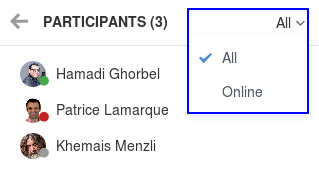 Select Share Link from the list of collaborative actions. Enter a valid URL, then click Share. 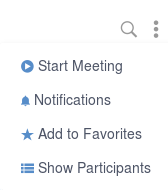 The shared link is displayed in discussion area with an icon in the corner. Select Upload File from the list of collaborative actions. Drag and drop the file into the DROP YOUR FILE HERE area, or click Select Manually to select a file from your computer. 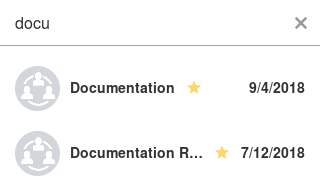 The uploaded file is displayed on the discussion area with the upload icon in the right corner . When the file does not have a thumbnail icon, it will be displayed as a clickable label allowing to open the file in preview mode. Select Ask a Question from the list of collaborative actions. Enter your question into the field, then click Ask to submit your question. The question is displayed on the discussion area with . Select Raise Hand from the list of collaborative actions. Enter your idea in the text field, then click Raise your hand. Your idea is displayed on the discussion area. In the right corner of the Raising hand message, a hand icon is dislayed. 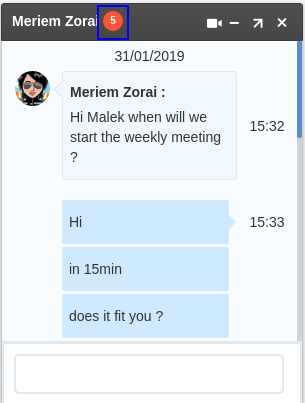 Users don’t stay all the time on the chat page, that’s why eXo Platform has added desktop notifications to alert users on a new message received in the chat, even when the browser window is minimized or hidden by another one. 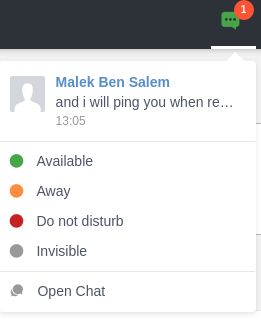 A desktop notification is a small popup displayed to the user to alert him on a new message received in the chat. Desktop notifications are sent only if you gave the permission to recieve notifications through the web browser. You are requested to give your permission the first time you access to chat application. a link at the bottom indicating the website from where the notification is coming from. When you receive the notification, clicking on it redirects you to the corresponding conversation in the Chat application. Desktop notifications complement other ways to draw your attention to new messages like the on-site counter and the bips. You can enable or disable these channels through the Preferences screen. 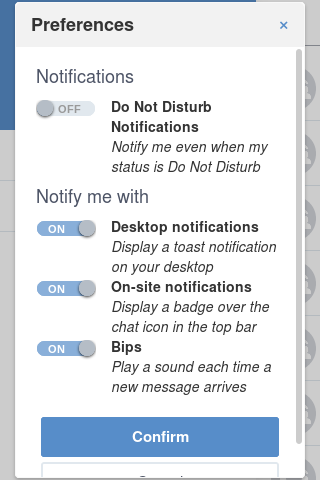 You can enable/disable a notification channel by changing the position of the toggle on/off. By default, all the notification channels are enabled. A Close button allows to dismiss the Preferences screen. The chat application displays the previously displayed room’s conversation. 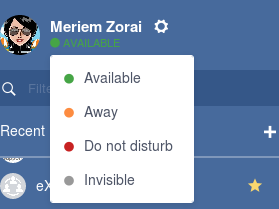 It is also possible to enable or disable notifications for Do Not Disturb chat status in the Preferences screen. By default, it is set to off. 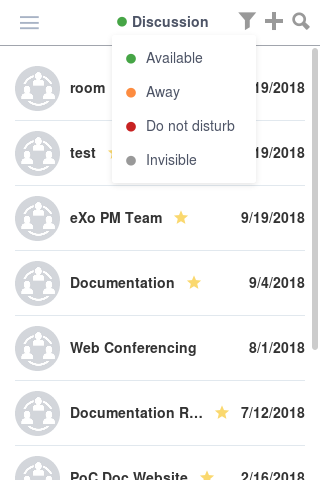 If you enable notifications for Do Not Disturb status, this means that whatever your chat status is, you will receive notifications. You don’t need to save the settings, they are immediately saved and applied. Select the room that you want to parameter it’s notifications. You can select either one to one chat room or a group chat room. Click on to display actions that you can do on that room. Select Notifications from the list. Normal: When you want to receive notifications for the chat room. 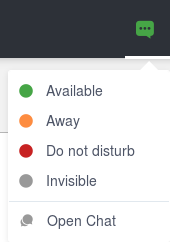 Silence: When you don’t want to receive notifications for the chat room. Alert on: When you want to receive notifications for the chat room if an another user send a message containing a keyword. When your contacts list becomes so long, it will be difficult to control all. Here are some tips commonly used to keep your contacts list well-organized and easy to find. Recent: sorts discussions starting by the most recent one. 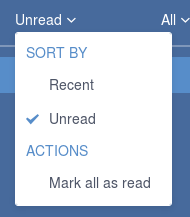 Unread: sorts discussions starting by the ones that contain unread messages and by the most recent received. This action will remove all the numbers of unread messages near the corresponding discussions. To find quickly a contact or group chat you often chat with, hover over one and click to save as a favorite. 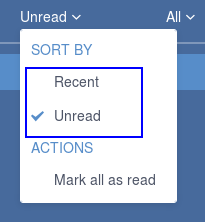 To remove one contact from your favorites, hover over the contact and select . All: lists all your discussions. People: to list only one-to-one discussions. Rooms: to list only rooms discussions. Spaces: to list only space discussions. 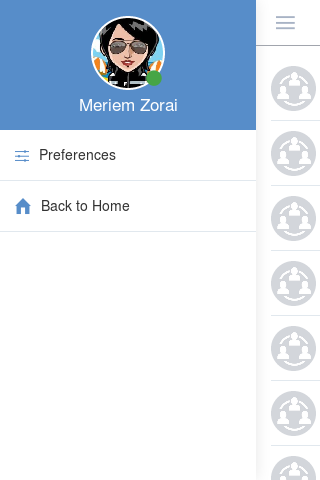 Favorites: to list the favorite contacts/group discussions. If you want to find a contact discussion or a chat room discussion, type some letters following in the search bar. The discussions will be filtered accordingly. No matter whether you remember the beginning of a group name, the first name or the last name of someone, the search will always return the best match. A clear icon appears when you type at least one letter on the search bar. This clear icon allows you to clear your filter by only one click. You can also clear your filter by clicking on the escape button of your keyboard. Discussing in eXo Chat by Sending and recieving instant messages induces to register the chat messages history which could be easily accessible later through the chat room. To visualize old chat messages, all you need to do is to scroll up the chat window, a loading icon appears the time to load up to 200 old message. When the loading icon disapears this means that the 200 messages was loaded and you can read them. The number of loaded chat messages is set by default to 200, it could be configurable in exo.properties. eXo Chat on mobile has the same features as for the desktop version. To open eXo Chat in a mobile device, you just need to click on the chat icon in the top navigation of eXo Platform. When you click on the Chat button, a new chat room view is displayed containing last discussions sorted by the most recent updated (received or sent). the timestamp of the last message received or sent. the user avatar in a circular form. the number of unread messages received. the availability icon on the avatar’s bottom right corner. the favorite star icon(to display only when the contact is selected as favorite and displayed just after the discussion label: user full name, space name or room). A back button allows you to return to the list of your chat rooms. Clicking on allows you to choose the notification channel for a defined chat room (either one to one chat room or group chat room). More details in Chat notifications section. 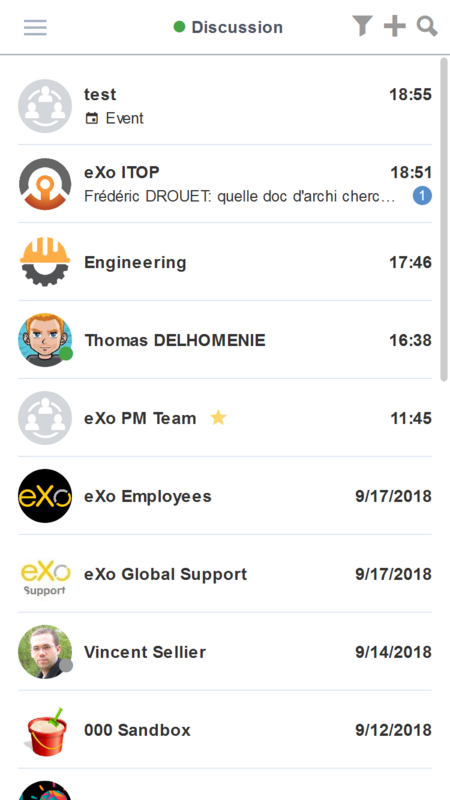 You can also update your status via the eXo Chat mobile application, you just need to click on the current status to display the list of possible chat statuses. Select the desired status that will instantly change. Sort by discussion status: recent or Unread. 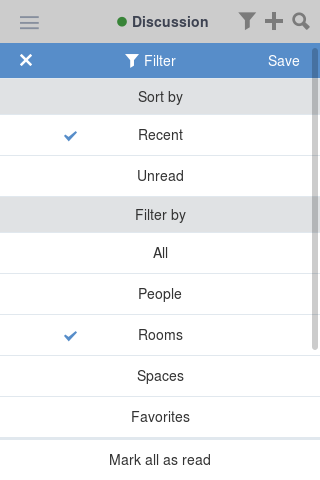 Filter by discussion category: All, people, rooms, spaces, favorites. It is also possible to mark your discussions as read by ticking the option Mark all as read. You should click on “Save” to conserve your filter criterias. If you click on Cancel , no of your selections will be considered.